God wants to be your Strength and your Protector. As we have seen, His people have many names for Him. And that He wants to protect us while we live here on earth. *Jehovah-‘Ez-Lami – Lord my Strength – Ps 28:7 The Lord is my strength and my shield; my heart trusts in Him, and He helps me. My heart leaps for joy, and with my song I praise Him. *Jehovah-Ganan – Lord Our Defense – Ps 89:18 Indeed our shield belongs to the Lord, our king to the Holy One of Israel. *Jehovah-Mephalti – Lord my Deliverer – Psalm 18:2 The Lord is my rock, my fortress and my deliverer; my God is my rock, in whom I take refuge, my shield and the horn of my salvation, my stronghold. *Jehovah-Metshodhathi – Lord my Fortress – Psalm 18:2 The Lord is my rock, my fortress and my deliverer; my God is my rock, in whom I take refuge,my shield and the horn of my salvation, my stronghold.
.*Jehovah-Misqabbi – Lord my High Tower – Psalm 18:2 The Lord is my rock, my fortress and my deliverer; in whom I take refuge, my shield and the horn of my salvation, my stronghold. 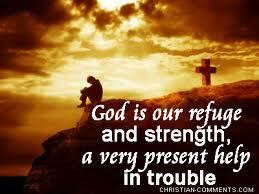 Is He your stronghold and your protector?